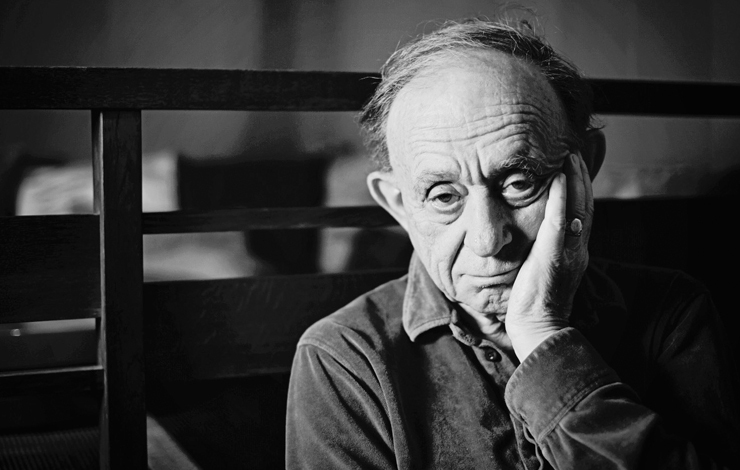 There is a powerful scene near the end of Frederick Wiseman's new film on France's 330-year-old Comedie­ Française that the audience has been waiting for without knowing it. A scene that causes everything else in the film—before it and after it—to fall into place, and moves the audience to understanding and to tears. A prominent member of the Comedie-Française, the actress Catherine Simare, visits a home for retired artists to present an award to another actress who had also been a member of the CF many years ago. The latter is having a birthday celebration, her 100th, and is quite moved by the visit and the honor. At one point she exclaims, with tears in her eyes, "What fun we had." Simare, perhaps confronting her own mortality, is moved by the experience too. The audience is encouraged (one could argue, forced), while watching these two charming women, to entertain a score of ideas on as many topics, which the film has cleverly prepared us to contemplate: the aging process in humans; the value of artists and arts institutions to a society; the difference between French and American attitudes toward theater; the value of a life in the arts; and the importance of tradition and a sense of history to artistic endeavors. The scene also suggests, finally, that we think about what lasts. The CF is, obviously, one of the things that lasts; it had been operating for over a century when Jefferson visited Paris in 1784. La Comédie-Française ou L'Amour Joué marks both the first time that Wiseman, best known for his probing vérité studies of American social institutions (Zoo, High School, The Store, Titicut Follies), has investigated an institution outside the United States and the first time the venerable CF has agreed to be the subject of a documentary. ID's Lance Bird interviewed Wiseman about his 28th film, which premieres nationally on PBS September 1. This is the first film you've done on foreign soil; I'd be curious to hear about the origins of the production. The origins were a little complicated. About five or six years ago I was in Paris, looking for a project to do in France, and mentioned to friends that I would love to do a film about the CF. Three years later, some French producers were talking to one of the administrators of the CF, who mentioned to someone that he'd always dreamed of doing a documentary by Fred Wiseman on the CF. So phone calls were made, and I met with the people there. How much time passed between when you knew you were going to do the project and the day you started to roll film? A year. I spent three months in the winter of '94 just hanging around there. Getting permissions was not an easy process. I had permission from the administrator, but nevertheless there were a lot of unions, and I had, of course, to get the permission of the actors. During that time you must have also been imagining possible scenes for the film. I was seeing scenes, but you know you never get the same scene twice. I was becoming familiar with what goes on there, and most important of all, the people at the CF were getting used to the idea that I would be making a movie there. I thought the film was beautifully lit. What percentage of the scenes were lit by you? Very little of it was lit [Laughs]; it was mostly natural light. The scenes from the plays naturally had the benefit of the theatrical lighting. What film stocks did you use? Some of the interiors were shot on Eastman 7298, some on 7293. Did you do arrange for special processing, do any overdeveloping? No. The statues were lit, and in one scene in the administrator's office we used one light because the light coming through the window wasn't enough. At what point in the making of the film did it occur to you to use street scenes and shots of the statuary around the CF as editing elements? I've used street scenes in other movies. I knew I would need transitions, because there are three different locations in the movie, three different buildings. So, i n order to give a sense of different geographical locations, I limited myself to street scenes that were natural routes between those places. I didn't want to jump around all over Paris. But I'm curious about how these scenes function as something more than cutaways. Their use in the film seems inspired, and I wondered if you were familiar with the photographs of Eugene Atget. So you had a sense that these street scenes could function on more than one level. Exactly. Also, I wanted them to give a sense of everyday life; but I did a similar thing in Model where there are streets scenes that connect the scenes in the model's agency with the various other scenes shot in photographers' studios. So in the CF film I was aware of how those scenes can fulfill more than one purpose. There is the literal purpose of showing you something of Paris, but they also serve the abstract and metaphorical purpose of giving you a sense of what everyday life on the streets looks like. It also gives you a sense of the past; for example, the bridge over the Seine that you see several times in the film is the bridge that Moliere's company first performed on in the 17th century. Did you have the idea that the busts were going to function in metaphoric sense too when you shot them? I knew at the time that I shot the busts I wanted to use them, but the attempt at more serious thinking only happens in the editing. Was this film edited on film editing equipment, or on a computer system like Avid? No, no. On a Steenbeck. I can't afford an Avid, and I may be too old to learn how to use it. But there's another thing too. I've almost gotten to the point now where I can tell if a film has been edited on an Avid; they're dumber. I like the idea of handling the film. When you do the rewinding, for example, it gives you the time to think about the work. It may be I just have the habit of cutting on film. I don't like the idea of cutting with computers. I have friends with Avids, and I've fiddled around with them, and apart from the price issues, they just don't appeal to me. The editors I know who've been forced to learn Avid like systems all have exactly the same complaint. One of things they miss most are those moments when they used to put trims away or make splices and they used that time to think. Yes! That's what editing is all about. The actual physical part of editing isn't complicated. Another editing question: With all that material and knowing that the film will be long and complicated, do you use any special techniques like wall charts? No, I use notebooks, and I don 't type up all the transcripts of the dialogue; I just work scene by scene and I keep notebooks. I don't necessarily think of acts in a theatrical sense, but I think in terms of the relationships of groups of sequences to each other, and I think about the beginning and end of the film. I'm very conscious of the fact, as anyone has to be who works with this kind of material, of trying to create a dramatic structure, whatever I may mean by a dramatic structure. The way the editing goes is that I start off editing whatever sequences interest me, just as a way of getting into the material, knowing that once I get started, I'm going to be sitting in the chair for the next 12 months. After about six or seven months, I've probably edited all of those sequences that might make it into the film, and during the editing of the individual sequences, I'm thinking about their relationship to each other, and making notes about what the connection is between one sequence and another. Then, after that six- or seven­ month period of editing individual sequences, I assemble a structure in a couple of days. The reason I can do this in a couple of days is because I've been working through the material for months. That cut usually comes to about 15 or 20 minutes of the final length. Then it's a question of fiddling around; I may change the order of a scene or two, but basically, by then I've got what I think are the structural outlines of the film. I often find that a sequence that I've edited, without my thinking about where it's going to fit or what's going to be before i t or after it, can sometimes be cut by 30 or 40 percent, because it no longer needs to have a beginning, middle, and end. I can just use parts of it and it works. Once I've got that first assembly, I move things around a little bit, but I'm more concerned about the internal rhythm of a sequence and the overall rhythm of the fJm. So it's a question of tapping my foot and finding out what I think the rhythm is. Do you actually tap your foot to find the rhythms? [Laugh ] No, I mean metaphorically. While you're going through all this, are you totally alone, or do you work with assistants? At what point do you begin showing it to people? I don't really show it very much at all. I don't mean this to seem arrogant, although it might sound that way, but I've never changed anything as a result of showing it. I show it to people who are friends, because I hope they'll enjoy it. I t's not that I'm not interested in getting comments, but at that point I feel that I've worked with the material and know it quite well. It's hard enough for me to make up my own mind—and I find it confusing to talk about it. That's it. Do you also prepare the tracks for the mix? Yes. I build the tracks and then I have an assistant, the same person who syncs up the rushes for me, who then breaks down the tracks and goes over them. How long did the mix take? For the CF film, the mix took four days. Is that part of the filmmaking process that you enjoy? Oh yeah, it's your last chance, and oftentimes you hear things in the mixing studio you've haven't heard before. And I have a lot of extensions [pieces of sound track that are longer than the scene to which they're cut]. When I'm preparing for a mix, I put the extensions in a little longer than I think they will actually run. I have ideas about sound when I'm working on the Steenbeck, but the mix is where you actually do it. Do you take sound on location ? That's why I was curious about the mix. Since you took sound on location and have the most visceral experience with it, it seemed to me that the mix would be important to you. So do you have favorite microphones? Are you a sound man? I've used the same microphones for years, the Sennheiser 815 and 416, and on the CF Film I used a lot of radio mics, more than usual. Which leads to another topic: your relationship with the cameraman. You're listening to the scene through head-phones. How do you communicate that you feel the scene is over, for example? We are constantly looking at each other, and we have little signals we use. Did you have discussions with your cameraman about what the film should look like before you began filming? Yes, we talked about that, but that changes too; we look at rushes every night, so we are constantly talking about the look of the film all through the shooting. The plays were very hard to shoot. We had to shoot live performances and from a box to the side. Often the theatrical lighting was not appropriate for film lighting and you could not, of course, change their lighting. For instance, Don Juan was very dark. Shooting with zoom lenses gave us very dark results, so we moved to a combination of fixed and zoom lenses. Did you ever shoot with more than one camera running? No, but because the same actors were used i n every performance, we were able to shoot from one side on one night and the other side on another night, and then I intercut the two performances. Have any regrets been expressed to you about giving you the access you got? No. The administrator loves the movie. I was just in Paris and showed it to the actors and the staff. Not everyone saw it, but the ones that did seemed to like it a lot. I thought there might be a problem because I've never worked in foreign language before and I've never worked in another culture, and French friends of mine said it would not be possible to make the same kind of movie with French people I make with Americans. But it wasn't true at all. And they said that French actors will put it on for the camera, but they didn't. Much to my surprise, it was no different than working here. But after a while they get bored with you and go back to doing their jobs, right? Yes, but it happened within 30 seconds, and the only time some of the participants in those meetings ever saw me was when we were filming the scenes they were in. At what point in the production was the scene shot where Catherine Simare goes to visit the actress who's having her 100th birthday? It was the end of the first week, I think. That was a gift from the gods, that scene. Yeah. It's been curious to me how that scene affects the whole film. You can watch that scene at the end of the film, and the reverberations work all the way back to the beginnings. I'm delighted to hear you say that; I think that too. It summarizes really all the themes of the movie. Will the film be shown in theaters in France? Because French television put up most of the money for the movie, it must be shown on television first. It's only after its French television broadcast that it can be shown in theaters. So then it's a question of whether or not it will get theatrical distribution. Do you hope to get it into theaters in this country? I would love to, but it's going to be on PBS on September 1, and it's very hard to get it into theaters after that. I would hope that perhaps the Film Forum [in New York] would run it. They won't run it soon after a public television airing, but they have run other films of mine some time after a public television airing. But you know it looks so much better on a big screen. Do you have any dream projects, something you would race to do if the money could be found? Yes, there is a fiction film I would like to do. I've written an adaptation of a chapter of a novel by Vasily Grossman, called Life And Fate. The chapter is called "The Last Letter. " I Did it as a play at the American Repertory Theater about seven years ago. It's a monologue delivered by a Russian Jewish woman doctor living i n small town in the Ukraine, a letter written a couple of nights before she knows she will be taken out and shot by the Germans. It's a recapitulation of her life and the story of her marriage and the bringing up of her son. It's about the reaction of her neighbors to the arrival of the Germans and the response of the Jews to being herded into the old ghetto. It made good theater, and I'm hoping to get a chance to do it as a movie. I've got the rights to it, and I'm trying to get the money to do it. Monologues are hard to do, which is one of the reasons to try to do it. Nobody instantly seizes on it as a commercial proposition, though. Do you ever have ideas for films that are little ideas? Do you think about making short films? [Laugh] Well, l think about them. I think the shortest film I've ever done was the first High School film; it was a mere 73 minutes. l pick subjects that either are complex or I think they're complex. I Think that the subjects I've picked lately are more complicated-not that the early films were not complicated. One risks, for example, being superficial in a movie about the CF, even at three hours and 40 minutes. What was the last film you saw that you really liked? The last film I saw that I really liked was Jane Eyre. I happened to see that three nights ago. It was a beautifully acted movie. Another film I saw that I rather liked was The Stargazer; by the guy who did Cinema Paradiso. It's about a con man who tours around Sicily offering to do screen tests for people. What a great topic. What kind of music do you listen to? So there's no music in your life. Lance Bird is a prominent U.S.filmmaker who’s currently at work on a film about Eleanor Roosevelt.